VATICAN CITY (CNS) — This Christmas will people go to adore and be amazed by Jesus, or will they let themselves be detoured by distractions? Pope Francis asked. In fact, one sign of holiness is being able to “be astonished, to feel wonder before God’s gifts, his ‘surprises.’ And the greatest gift, the ever-new surprise is Jesus,” he told Vatican employees and their family members during a meeting Dec. 21 in the Paul VI audience hall. The pope continued a tradition he began in 2014 of offering Christmas greetings to people who work at the Vatican. 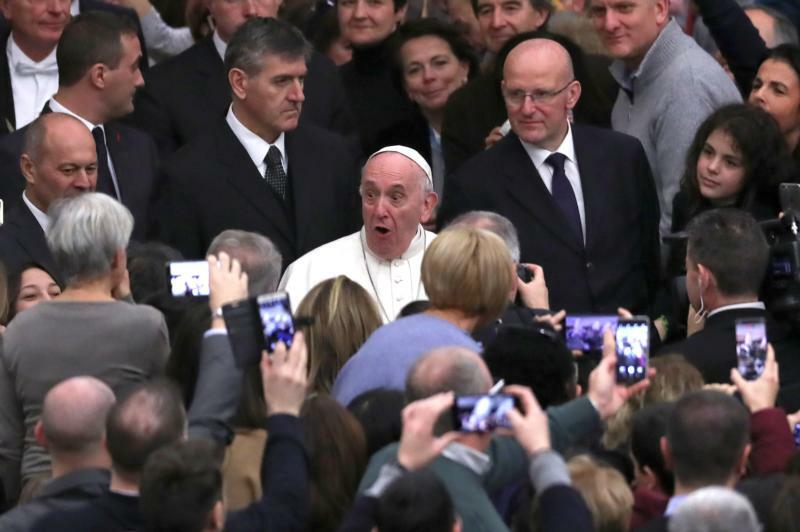 The special audience comes right after a longer-held tradition of the pope meeting with officials of the Roman Curia. Christmas cheer was in the air as Vatican employees and their families, many dressed in festive clothes, greeted the pope and gave him Christmas cards, gifts and hugs. Christmas is the season of joy because the source of true joy — Christ the savior — has come, the pope said. “But often we realize that people and perhaps we ourselves are caught up in so many things and, in the end, there is no joy or, if there is, it is very superficial. Why?” he asked. Joy, he said, comes from being holy or at least trying to be good, being close to Jesus and letting oneself be touched by wonder and “contaminated” by the joy that surrounds him. Mary, Joseph, the shepherds and all the others gathered at the manger, gazing at the Christ child, are “overflowing with holiness and, therefore, with joy,” he said. People must not be superficial saints, just “normal saints,” that is, people who are holy even with all their defects and sins because “we ask for forgiveness and go forward,” he said. Little things like that make the workplace “more breathable,” too, he said. It lightens up that stifling environment “we create with our arrogance, closed-mindedness and prejudices, and people even work better” with better results. The pope reminded them to avoid criticizing others behind their backs. If something is bothering them, they should confront the person directly and speak frankly, he said, or else just bite their tongue. With this being his sixth Christmas at the Vatican, the pope said he has gotten to know many holy people who work there. Often these saints “who live next door” are hard to notice because they are modest, do their jobs well and work well with others, he said.